I have UGLY bumpy plaster ceilings all over my house. Every ceiling looks different, all are different ages and in varying states of unattractiveness. The ones in my LR and kitchen area are especially awful. They have been patched, spackled, painted and repainted more than I want to recount. I don't want to deal with them again. Don't want them scraped, as I just do not have the stregth of soul to deal with the mess. Don't want patching because it has been done many times before. Anyone had experience with floating a new ceiling with styrofoam or new style plastic panels ? I thought about drywall, but it just seems that MDF would be too heavy. Were the answers posted last week not what you wanted to hear? Don't want them scraped, as I just do not﻿ have the stregth of soul to deal with the mess. Don't want patching because it has been done many times before. Oregontochapala, thanks so much for tracking and timing my posts. I suppose I will have to be more astute in the future not to sound repetetive and tdo my best to avoid taking up people's valuable time by asking them to read a post on a topic more than once. As to whether or not the answers were not to my liking, well, the suggestions offered before were much appreciated, but not applicable in this situation. In fact, I am asking specifically about floating ceiling panels. I am not familiar with the term. Do you mean, "suspended ceiling tiles"? Are you looking to get that retro-modular look? I know you do not want to do this but your only real solution is to to scrape the ceilings back to base and start over. The suspended ceiling will look out of place in a Mexican casa and hurt your resale price if you one day want to sell casa. RVGRINGO, yes, suspended ceiling tiles. Angus, I could not see the pic, but no, I am not going for the retro office/modular look. I must say, though, that mid century modern calls to me. Must be the look of my childhood, the look I saw in the homes of my parents' more prosperous friends. I had great fun in the 50-60s ! Things have come a long way in what is available. No more does it look like acoustic ceiling tile. I remember looking up in grade school and seeing the pencil holes in my classroom tiles. More to my mind was a look of beadboard paneling, or tongue in groove weathered wood. Rafterbr, I am at the age and stage that I don't really care about adding to the resale value of my home. It's a nice, spacious house in a good, middle class neighborhood, and has been added on to so many times over the years that it isn't a typical Mexican Casa with that style and charm. We bought it for the location, ample size, guest suite, breathing room, sunporch, patio, mirador and big, but not fancy, kitchen. No Mexican touches except 2 arches and 40 year old talavera tile. We even still have a 1970s baby blue tile bathroom in perfect condition. Whoever did that little bitty ceiling did it perfectly ! The buyers of this house, whether we are off to the nursing home or dead and gone, will have to revamp the kitchen and baths, so they may as well unscrew the brackets and remove the ceiling, and then THEY can endure the mess. That was what appealed to me. The ease of hiding the ugly, without a permanent glue down installation. I don't mind hearing it, but am definitely open to something other than endless dust. I just don't want to look up and see ugly every time. Simplest solution might be to take off my glasses and just not look up, I know. That's a very nice clean look! Unfortunately, I think it's going to be hard to find the right hardware here... and your very first purchase should be a "surround the room" laser level. It's basically like laying a tongue and groove floor but in reverse. I think you would put up the crown molding first on a line that you have made with the laser and then feed the tongue and groove onto it. Depending on the unevenness of the ceiling, you may be talking about a lot of shims behind the boards to make it level... and a brad nailer to attach the boards and the molding to the shims/ceiling/walls. BTW, I wanted a photo to know if your ceilings were "flat" to begin with. I think it is a nice look, too. I can post a pic, sometime later tomorrow. My ceilings are "flat" I believe. The bumps are more like plaster clumps. Small ones, like real popcorn, not what they call popcorn ceilings. It is not a covered boveda. I wish it were boveda, which I have in several rooms. I totally expect to have to get the hardware from the states and the materials, too. Good idea on the laser level. 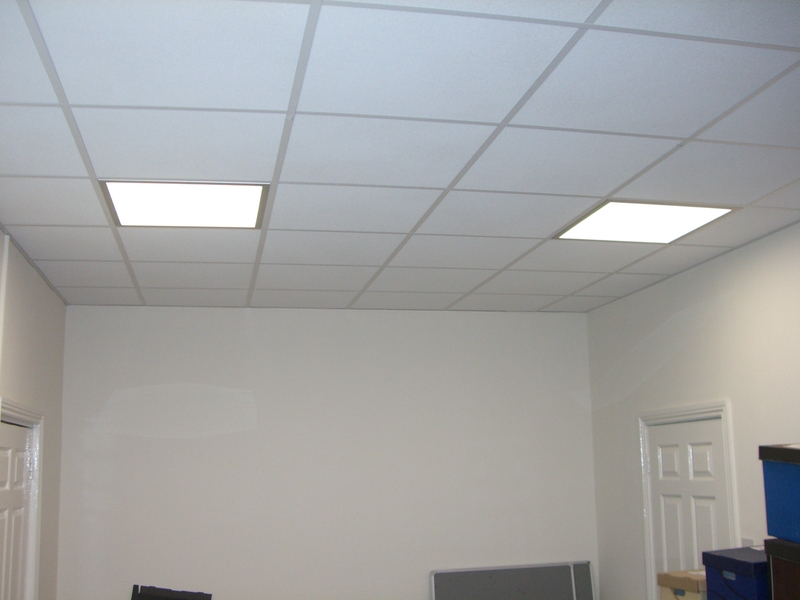 I have been speaking with one contractor, who has had experience with suspended ceilings in office buildings in the US. Thanks for taking a look at the idea. Go for it! And please post before and after pics. Sometimes ya just want what ya want and you've obviously been rolling this around in your head for a while. I wish you the very best of success! A friend and I did a suspended ceiling in her house many years ago to hide the ugly ceiling above. But she didn't want that white retro look, so she bought some inexpensive, but nice patterned fabric and we stapled around the edge and onto the back of the ceiling tiles before dropping them in. It looked really good. That's another great idea mudgirl! Or, how about the ceiling being a giant stretcher board for a... canvas drop cloth (seamless). You could dye it, paint it, stencil it or tie dye it. They are not usually pre-shrunk but come in sizes up to 12 feet by 15 feet. Those are really cool ideas, and, if the space was smaller, would definitely be contenders. However, husband doesn't want that artsy of a ceiling. I think I will stick to the panel or beadboard look. I will definitely post before and after picks, but it will probably be after the rainy season. I have one or two trips planned to the US and then I will get a hands-on look at the panels so I can decide. Thanks so much for understanding my position and for the suggestions. I do not like that suspended ceiling look. It reminds me of cheap, 1980's office space, "cubicle farms" I have helped many heritage building owners in Vancouver to replace them and repair the plaster. Once the ceilings were opened up and repaired, the owners were estatic, and were able to rent the space as premium. I guess you didn't click on the armstrongceiling link that cstone posted. About as far from the suspended ceilings of the '80's office space as is possible.